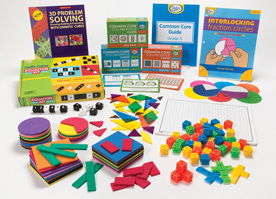 The Didax Manipulative Kits are relevant to each grade and link the manipulatives to the content standards. Each book provides engaging lesson plans which allow students and teachers to get the most from their manipulatives whilst enhancing their understanding of the relevant standards. 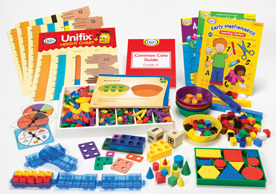 There are K-2, 3-5 and 6-8 exactly aligned Common Core Mathematics kits and as you can see many other useful combinations. In particular you might want to look at the interactive geo board set of materials which is particularly helpful for geometry challenged students.